Each bottle features Finest Call's patented pourer and closure cap that reduces drips to keep your bar free of spills and messes. The long bottle neck and patented pourer top help provide a perfect pour every time, while the closure cap solves the problem of storing any unused portions. Easy for your mixologists to use, the liter bottle also has an attractive shelf presence. This Finest Call premium strawberry puree drink mixer has a smooth texture that dissolves easily in your most popular drinks. Since strawberry is such a popular sweet and fruity flavor for drinks and desserts, you'll be sure to find an endless number of ways to use this versatile drink mixer. Combine that with its user-friendly packaging, sleek design, and patented pourer top, and it's sure to be a smart addition to any bar service! For a frozen strawberry daiquiri, blend 4 oz. Finest Call Strawberry Puree, 1.5 oz. of rum, and 1.5 cups ice. Refrigerate after opening. i used this strawberry puree mix to make a tropical strawberry banana shake. I put 4 ounces of puree mix, 2 ounces of banana puree mix, 1 cup of frozen strawberries, i cup of frozen banana (to avoid having to use ice), 2 scoops of old fashion vanilla ice cream. It made about 28 ounces of shake, but I needed 32 ounces for the large shake my patron ordered. so I filled the top of the shake with the rounded lid, with whipp cream, Oh my!!!! it was beyond delicious. We've had great success with the Finest Call line of drink mixes. The Strawberry is great for a variety of drink recipes, making those iced or blended drinks refreshing. Because it contains only 21% juice, I ordered this strawberry puree mix as a cheap replacement of real fruit, and I did not expect too much about it. But it turned out that this strawberry mix tastes great and is perfect for smoothies. The flavor of this is out of this world. It doesn't taste artificial but at the same time can hold it's own when mixed with other Finest Call mixes. I ordered this syrup to use as additional flavor for my fresh lemonade this summer. It's delicious and easy to use. 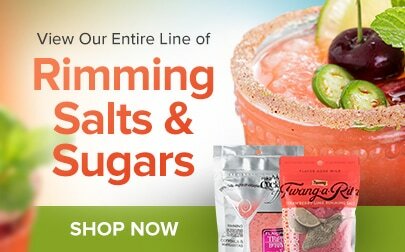 I've since found many other uses for it, including other drinks and even some of my desserts !! Oh my gosh, what a time saver! We use this Premium Strawberry Puree Drink Mixer for our New Years Eve Party. This was used to make a Lava Flow Cocktail. We got so many compliments about how fresh and tasty the drink was. We also use it on Belgian Waffles. Delicious!!! Tried a whole case of Finest strawberry puree. Very good product comparing to Monin peach puree. Mixed well with all the drinks. Customers love it. Will buy again! This Strawberry puree mix was bomb! Very tasty & did not leave a bad after taste. People loved it & we will be buying more! We've used Daily's Strawberry mix for years and years. Bought this on a whim, and the flavor is so much better. It's price is comparable ounce for ounce, so it's a no brainer for our restaurant. i love these fruit flavored puree drink mixers for a variety of fruit based drinks we serve.its also much cheaper then the brand named ones! The strawberry puree from Finest Call was a very pleasant surprise. The puree tastes great and is an excellent mixer for all drink varieties and styles. We use a lot of the different purees for our drinks and our Tropical Fish Bowls would not be complete without the strawberry puree finish! This has a great flavor to it but unfortunately we couldn't use it for the purpose I had intended. I think this would make a great daiquiri. Another one of finest calls great products. 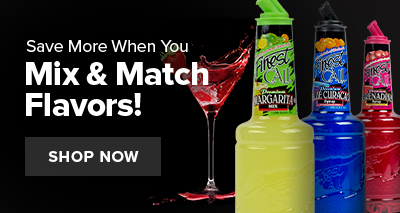 It is perfect for flvored lemonade and is our number one seller. We order it on a regular basis. works great as a addition to fresh fruit in smoothies, or as a topping on deserts of ice cream! easy to portion with the bottles love it! Strawberry drinks are ready to go! 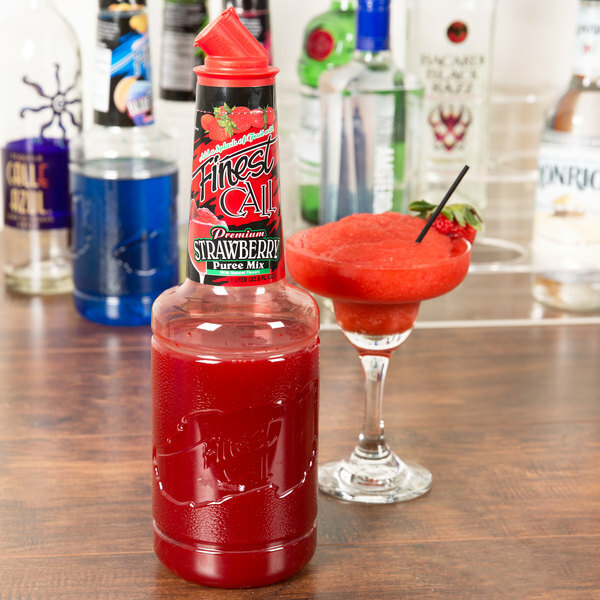 The Finest Call 1 Liter Premium Strawberry Puree Drink Mixer is perfect to get the party started love it! 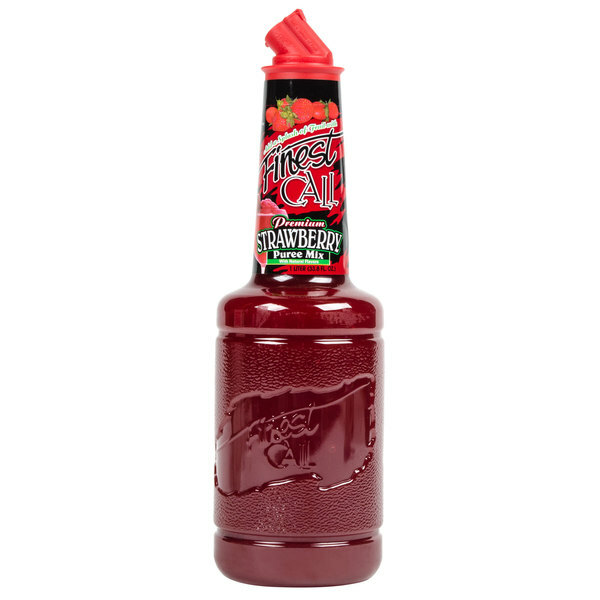 We use this as a puree in our strawberry lemonade and our customers cannot get enough of it!!! 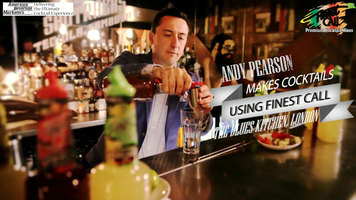 We run through about a case of this a week and Webstaurants has the best price on this by far. Best and cheapest option for strawberry. Perfect for strawberry lemonade and strawberry milkshakes! Doesn't take a lot to get a good flavor and is very cheap.